When someone says a game is "old school" that usually means it has a retro art style or super simple gameplay, but for anyone who grew up in the 8-bit and 16-bit years knows that games of that era were much more than that. They were hard. Punishingly, brutally hard. And while Kero Blaster is indeed "old school" in its aesthetics, it also calls back to the games of yesteryear by being a classically unmerciful platformer. Kero Blaster comes from Daisuke Amaya, the developer of the beloved title Cave Story, so the quality of the game is as fantastic as you'd expect. The retro graphics, soundtrack, and absurd plot match up perfectly with a game you'd have expected to play back on the Super Nintendo or Sega Genesis. You play as a frog, working as a lowly janitor for a massive company that happens to have a whole bunch of teleporters. When gruesome creatures begin appearing from the transportation devices it's up to you to travel to each of the connected worlds and dispatch them. Along the way you'll have many stressful "meetings" with the company's president as they berate you and demand that you work harder. And work hard you will, as each level is filled with dozens upon dozens of enemies ranging from simple blobs and snails to massive robotic creatures with specific weak sections that you must target. As you power through each area you'll gain coins that can be used to upgrade your weaponry and health meter, and buy single-use items to help you along. If you fail at any point -- and I promise you that you will -- you start at a checkpoint or, if you've exhausted your lives, back at the beginning of the level. Because you keep your coins even when you meet your demise, it's possible to simply grind your way to a more powerful weapon or health boost even if you're making a habit of failing, so there's always progress to be made. Still, the levels quickly become daunting, and you may feel a twinge of rage that you've not felt since trying to best Mega Man 2 or Bucky O'Hare. 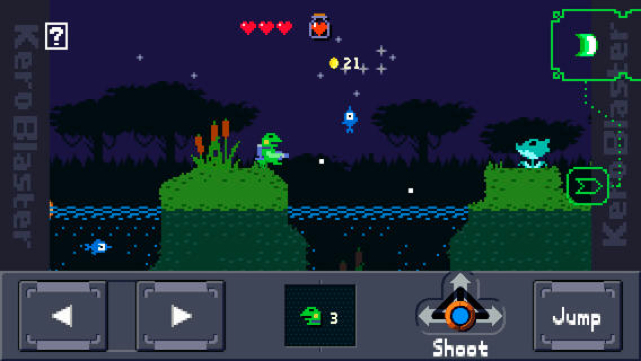 Kero Blaster makes interesting use of the touchscreen by adding a sliding "shoot" toggle to the standard directional and jump buttons. You can choose to have your character endlessly fire left, right, or directly upwards, while you navigate each level. This makes the frantic shooting a bit more manageable than most platformers on iOS, but it's still by no means easy. At US$4.99, Kero Blaster is a massive game with a ton of content, and it's a fantastic trip back in time for anyone who remembers a day when games didn't bother holding your hand. Pick it up, and prepare to rage.